THE SAUDI ARMS DEAL SUDDENLY TRIPLED IN SIZE WITH LONG TIME SCHEDULE WITHIN THE AGREEMENT… TRUMP COMPLETED THE SINGLE LARGEST ARMS DEAL IN US-HISTORY, DONE WITH SAUDI ARABIA… IT EXCEEDED THE PREVIOUS COMMITMENT FROM TWO WEEKS AGO, NOW WORTH $350 BILLION… WITNESS US-STYLE ECONOMIC STIMULUS, THE TOXIC WAY… THE USGOVT SUPPORTS THE FADING SAUDI KINGDOM, SUPPORTS THEIR VICIOUS YEMEN WAR, AND APPLAUDS THEIR SUPPORT OF ISIS TERROR… THE USGOVT IS ENCOURAGING THE FORMATION OF A GULF REGION NATO, SURELY DEDICATED TO US-ARMS SUPPLY… CURIOUS THE PAYMENT METHOD TO COME, WITH CONJECTURE. The USMilitary-industrial complex has come to the rescue of USEconomy with the massive arms sale to the world's biggest purchaser of weapons, namely Saudi Arabia. Beyond the glitz and royal pageantry, President Trump's visit to Saudi Arabia in all likelihood had a main purpose to sell weapons, and to complete a gigantic $350 billion over the next decade. It will have weapon orders filled over time. In turn, the Saudi Royals have promised to invest $billions in the United States as well and to make other commitments designed to placate Trump. The pablum on the official line is that the first phase, with $109.7bn in weapons purchases, will boost Saudi Arabia's defense capabilities, bolstering their security services in the face of extreme terrorist groups, and the new threats from Iran. The White House added that the deal will create defense jobs while also reaffirming America's commitment to Saudi Arabia. What a load of rubbish! The Saudis created the Yemen War in order to steal their neighbor’s energy deposits, thus creating a critical situation with consequent certain backfire. The USGovt support of Saudi Arabia goes hand in hand with desperate clinging to the Petro-Dollar. The defacto standard is in its final phase of demise. So the USGovt pledges support to the entire Gulf set of partners, which means the oil monarchies. If the kings and princes do not respond with overt support, they risk being murdered, or having untold terrorism unleashed on their people. The deal will provide Saudi Arabia, the world's largest importer of weapons with high quality equipment and services including missiles, bombs, armored personnel carriers, Littoral Combat Ships, THAAD missile defense systems, and munitions. The Trump economic advisor Gary Cohn said that Saudi Arabia would hire US companies as a result of the defense deal, and make significant investments in the US. The other side of the deal would lead to many US companies invest and build things in Saudi-land. The Saudis are expected to provide back support for certain USMilitary operations on an unspecified nature. Saudi Crown Prince Mohammed bin Salman conducted negotiations on this deal shortly after the 2016 US election when he sent a delegation to Trump Tower to meet with the Jared Kushner, the liaison of dubious variety. The prince is the regular actor on the Saudi stage, since King Salman is senile, suffering from dementia, and cannot hold a conversation or a pen. Curiously, the lapdog Washington Post (owned by Amazon CEO Bezos) called the deal a cornerstone which further encourages the Gulf states to form its own Gulf State Alliance like the North Atlantic Treaty Organization (NATO) military alliance. WaPo dubbed the alliance the Arab NATO. Naturally they would call for all the Arab oil monarchies to be armed to the teeth, supplied by US arms dealers, and promote war economy rather than healthy balanced economies. The deal extended beyond weapons. Saudi ARAMCO will sign initial accords and joint venture agreements valued at about $50 billion with companies including General Electric, Schlumberger, and Halliburton, according to the petro conglomerate CEO Amin Nasser. GE Plastics is also involved. Expect their attempt to expand trade to be 80% weapons, 20% oil services and others. In addition, ARAMCO plans to sign accords with Baker Hughes, KBR, Jacobs Engineering Group, Nabors Industries, Weatherford Intl, McDermott Intl, and Rowan Companies, claim insider sources. The industrial sector of the USEconomy is in bad decline. Much capital spending has been delayed and put on hold. The US Neocons are very happy indeed for the war spending, war footing, and war emphasis. The chief exports from the United States remain toxic bonds, military weapons, laced vaccines, tainted agri-seeds, prescription drugs, and obesity. The Deep State celebrates. Their captains, barons, and henchmen should be very happy. It is said that the Trump Admin has now sold more arms to KSA than the last two presidents combined. This direction is his version of Making America great again. Behold the swamp still present in its full glory. See Zero Hedge (HERE). SAUDI ARMS DEAL HAS A FEW POSSIBLE HIDDEN ANGLES… THE SAUDIS MIGHT BE FORCED TO SPEND THEIR USTBONDS STUCK IN THE EXCHANGE STABILIZATION FUND, SERVING AS ITS CORE… THE SAUDIS MIGHT BE USED AS CONDUIT BY THE LANGLEY CREW TO FUNNEL ARMS TO THE ISIS GUERRILLAS, ALL DONE VIA ARAB INTERMEDIARY… THINK A PORTION FOR THE YEMEN WAR, AND A PORTION FOR ISIS UNDER USGOVT DIRECTION… LASTLY, THE SAUDIS MIGHT BE SELLING THE USGOVT A STAKE IN ARAMCO, PAID IN US-MADE WEAPONS… THE PAYMENT COULD COME FROM US-BASED PRIVATE FUNDS… IT WOULD MEAN THE US-PUBLIC IS FINANCING THE MIDDLE EAST WARS WITH THEIR HOUSEHOLD FUNDS, SOLD FOR BADLY OVER-PRICED ARAMCO FRAUDULENT PAPER… THE LAST TWO SCENARIOS COULD BE AT WORK TOGETHER. A hidden angle on the financial trail. The Saudis might be compelled to use their tightly held USTreasury Bond assets for payment in the huge arms deals. They USTBonds might be the core to the USDept of Treasury’s critically important elite Exchange Stabilization Fund. It is rumored to be valued in the multiple $trillions. The Saudi stake is believed to be around $3 to $5 trillion, the bulk of four decades in Petro-Dollar surplus profits. The scummy deal might have been struck in the mid-1970 decade for the basis of the Petro-Dollar Standard. The Saudis sell oil in USD terms. The US buys primarily from Saudis and other cooperating Gulf Arab oil monarchies. The Saudis recycle profits into USTBonds. But the Saudis also are bound to make very large purchases of US-made weapons on a regular basis. The conclusion of this sordid deal, as in the last stage in the demise of the Petro-Dollar defacto Standard, calls for the Saudis to deplete their USTBonds stuck in the ESFund, and to use the funds for grand weapons deals. This is theory #1. Another hidden angle. The Saudis are in a position to receive discount weapons from the US. It is doubtful that full price is paid, since both nations are in a certain degree of desperation. Watch the Saudis sell those same weapons to other counties, that the USGovt and USMilitary directs as destination, for a profit. Furthermore, expect that the Saudis will become the primary supplier of weapons to ISIS via other channels. The United States clearly has been using Saudi Arabia as a front for supplying ISIS and the terrorist guerrilla organizations. The connections to Langley and to the US Senate are well established. Senator John McCain is their main agent in the USGovt. The rub in this theory #2 is that ISIS has increasingly been a ISIS target for terror. Save the best for last, a theory by EuroRaj. Consider the big deals and the numbers involved. Now that the Saudis have $110bn in new toys for war, some of those will be put to good use. Very few $billion coincidences ever occur, an old adage. Difficult to call it pure coincidence that the Saudi ARAMCO IPO deal was priced at $100bn, but it is stalled on confirmation of value. The US arm sales to Saudi Arabia was priced at $110bn, close enough. Think the process and pathway through. The Saudis might not have sold to the USGovt actually, but perhaps to US-based funds stuck with USTreasurys and looking eagerly to unload them. The Saudis might have sold a $100bn stake in ARAMCO to the US public via the tarnished back door, like to pension funds, insurance companies, and mutual funds. Funds like Vanguard are as dirty as the sewer is deep. The dirty Royals do not take USTreasurys as payment but instead request payment in arms. It is their option, and the Pentagon might have brokered the deal from the fund managers. This is possibly barter on a grand scale. Irony is thick, since the Saudis might have rejected the USD and preferred something more tangible, the hard asset of war materiel. Double the irony, as the US public might unknowingly be funding a $100bn war in the Middle East, with locations both in Yemen and Syria. 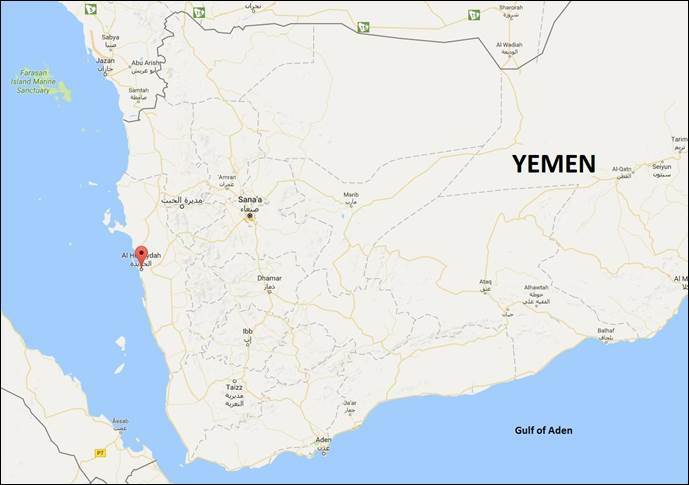 To be sure, 90% of the people in US households could not identify Yemen on a map. Again the bagholder, the US public receives worthless paper in return, equity in ARAMCO, which is possibly over-priced by at least four-fold. The Saudis have lied bigtime on their oil reserves. They are selling drained deposits in a massive con scheme. The deal might just be a giant win-win deal for the warmongers. This is theory #3. Consider finally a fine rebuttal by Jackass colleague London Paul. He always sees through the muddle. His words, my minor edits and a few additions in the same line of thought. The House of Saud have far more issues to worry about internally than financing ISIS or providing ISIS weapons. They are now in the crosshairs of the very same guerrilla outfit. The Kingdom of Saudi Arabia will go up in flames soon enough. The Saudi Royals are terrified of enemies internally and externally. They have a useless military and they are buying a barrel full of second-tier quality weapons in the process. The THAAD missile defense system is not state of the art, with exaggerated effectiveness, as is just about everything else the USMilitary produces. No doubt they could pay for these second-rate toys using the ARAMCO IPO. However they are being screwed over, and being played by the Pentagon. Like always, Russia holds the whip hand. The Saudis had been well along in talks about buying the S-400 missile system and other arms from Russia. Moronically, they backed the wrong horse as US influence in the region is on the wane. Next watch as the Saudi kingdom disintegrates into fragments via internal combustion, reckless insolvency, and external attacks. Given their war crimes with neighbor Yemen, their ruin would come as justice. SAUDI ARABIA AND RUSSIA HAVE AGREED TO EXTEND OIL CUTS TO MARCH 2018 AT A MEETING IN BEIJING… THE CARROT TO DRAW SAUDIS UNDER THE EASTERN UMBRELLA CLEARLY IS OIL OUTPUT CUTS, INTENDED TO SUSTAIN THE OIL PRICE… NEXT COMES OIL PAID BY CHINA TO SAUDIS IN RMB TERMS, A LONG AWAITED EVENT… THE LAST DAYS OF THE PETRO-DOLLAR ARE UPON US… RUSSIA IS PLAYING WITH THE OPEC LEADER, AN ACT ON THE WORLD STAGE… RUSSIA HAS HIDDEN PLANS. Saudi Arabia and Russia will work together to prolong crude oil cuts by global producers through the first quarter of 2018, setting a firmer timeframe for a likely extension of the curbs. Crude prices responded with a slight jump on the news. Further work must come to reduce global inventories to the five-year average. The energy ministers of the world’s biggest crude producers held a press conference to announce the accord between Russia and the Saudis. The more important aspect was the location of the meeting, in Beijing. Russia and Saudi Arabia, the largest of the 24 producers that agreed to cut output for six months starting in January, are reaffirming their commitment to the deal amidst growing doubts about its effectiveness. Surging US production has raised concern among OPEC members that their members are failing to reduce an oversupply. Oil has surrendered about half its gains since their accord late last year. OPEC is without teeth, but Russia has chosen to align with the Saudis toward their own goals. The Jackass conjecture is that Russia is using the Saudis with their own motives. Russian President Vladimir Putin commented. “It is right that the decision was made not for two, three, four months but for nine months. That is the most important condition for stability.” The strategy appears to have Russia, a non-OPEC nation, extending its cooperation with leading OPEC player because Saudi Arabia wants price stability and is complying with its obligations in the deal, so believes King Vlad. The energy summit was held between Russian energy minister Alexander Novak and Saudi oil minister Khalid Al-Falih. OPEC members agreed in November to cut 1.2 million barrels a day of oil production. Several non-members, including Russia, agreed in December to contribute a combined 600,000 barrels a day of output reductions. In contrast lies the United States which is not part of the agreement. During the cutbacks, production in the US has risen to the highest level since August 2015. Notwithstanding, American crude inventories have fallen for the past five weeks from record levels at the end of March. Kazakhstan, the biggest producer among the former Soviet Republics, disclosed they are not ready to join an extended accord automatically, so claimed its Energy Minister Kanat Bozumbayev. The Central Asian nation will discuss its level of participation at the Vienna gatherings for OPEC on May 24 and 25. The Russian camp reported that from preliminary consultations, almost all parties are committed, such as the large Russian energy firms. The deliberations come as two OPEC members remain exempt from the cuts have strived to increase their nation’s output. The output by Libya has risen to more than 800,000 barrels per day, the most since 2014. In the meantime, Nigeria has succeeded in bringing its Forcados pipeline online. It will direct flow of 200,000 barrels per day, ready to export again after almost continuous halts since February 2016. Iran has special status afforded from the signed nuclear deal, as its output is up significantly. It is unclear whether the countries would still be exempt if the deal is prolonged. See Bloomberg (HERE) and Financial Times (HERE). EuroRaj made some key comments. “The location to announce this in Beijing is interesting. Soon they will both agree to price oil in Chinese Yuan terms, effective at a future date. The two nations might have already agreed to price oil in CNY. With Turkey leaning East, the Saudis are seeing the writing on the wall, for negotiating with Russia rather than the United States under the Chinese umbrella. The last thing the US consumer needs this summer is an oil price increase.” The Jackass adds that maybe Russia & China have a plan with the Saudis, to exploit them, to use them, and then to ditch them. They might make agreements which accelerate death of the Petro-Dollar. They might work to advance the Eurasian Trade Zone with wider Chinese RMB currency usage in trade payments. Then later, the two Eastern superpowers might betray and discard the Saudis as partners. The entire ARAMCO deal remains of special interest. The Russians might expose the IPO stock equity deal as overpriced by factor of 4x, as per Western oil sector analysts. On the other hand, the Chinese might pledge an overpriced amount in the giant Saudi petro business in return for an agreement that China would pay for Saudi oil in RMB terms, no longer in USDollar terms, a Jackass theory. *** The Voice has his strong doubts on agreed oil output cuts, but his comments are saved for the May Gold & Currency Report. THE BATTLE FOR YEMEN HAS BECOME A QUAGMIRE FOR SAUDI ARABIA AND THE UAE… ALREADY SUFFERING FROM NATIONAL DEFICITS, THEIR COSTS ARE AMPLIFIED BY THE YEMEN WAR… COMPLEXITY ABOUNDS AS THE SAUDI-LED FACTION IS IN EXTREME OPPOSITION VERSUS THE UAE-LED FACTION, THEIR CONFLICT HAVING TURNED VIOLENT IN THE ADEN AREA… EXTREME COSTS, CHAOS, AND DISUNITY ARE KEY. It is important to review some details on the faceless violent distant war in Yemen, a very poor nation with many tribal lords and some warlords. The US public is intentionally kept unaware and uninformed, easily made gullible to believe that the battles are sectarian and involve the tired line of terrorists. Instead, the deep underlying motive for the war is the gradual depletion of Saudi oil reserves over the last two decades. The smaller numerous Saudi oil fields do not compensate well for the near total (like over 98%) depletion of the giant Ghawar field. The Saudis wish to steal the plentiful extensive untapped oil & gas reserves from neighbor Yemen, with whom is shared the Arabian peninsula. The Yemen War has endured for 26 months. Its campaign is led by both the Saudis and UAEmirati. The war, which began in March 2015 and was ambitiously named Operation Decisive Storm, has pursued a plan to install once more its highly unpopular president, Abd Raboo Mansur Hadi. Many Yemenis view as him as a traitor. He remains in exile in Saudi Arabia along with most of his government. The other goal for the Yemen War was to defeat the Houthis in Yemen, a Zaidi Shia organization that is now allied with many of the most capable units of what was the Yemeni Army. While the Houthis and their allies were pushed out of the port city of Aden and, most recently, the small Red Sea port of al-Mocha, the Houthis have retained control of the capital of Sanaa and most of northwest Yemen (re: Gulf News, February 10th). For months, the frontlines in what is a complex multi-actor civil war have remained fixed. This is despite the fact that both Saudi Arabia and the Emirates have spent $billions on persistent and devastating airstrikes, and backed a disparate mix of anti-Houthi forces and ground forces made up primarily of mercenaries, like from Sudan. The Yemeni civilians have taken the brunt, with many thousand dead and more wounded. Rather than the short decisive intervention envisioned by Saudi Arabia’s princes and generals, the war is a quagmire with no military solution. The physical and political terrains of Yemen are unkind to outsiders, hilly and mountainous and exposed. Even a cursory reading of Yemen’s history shows that both have proven fatal for invaders, ironically much like Afghanistan. Yet rather than reevaluating their intervention in this complex civil war, both Saudi Arabia and the Emirates seem poised not only to continue the enduring war, but also to enhance their involvement with further weapons shipments to dubious forces. It also seems likely that they will launch a possible offensive on the port of Hodeidah (seen by the red marker), currently under control by both Houthi forces and their allies. Neither of these tactics is likely to succeed in defeating the Houthis. Instead, both the United Arab Emirates (UAE) and Saudi Arabia risk being drawn deeper into a war that cannot be won. The only certainty is that ongoing involvement in Yemen’s civil war will prolong the conflict and drain their treasuries of more $billions. Ultimately the Saudi and Emirati deepening involvement in Yemen’s civil war may pose more of threat to their own governments and ties within the Gulf Cooperation Council (GCC) than to the Houthis. There are already signs that the Emirates and Saudi Arabia are in conflict over how to continue prosecuting the war, and even how to divide Yemen for their own future control. Behold the war within a war. Consider one hotzone under dispute with intense battles. In February 2017, Aden’s international airport was the scene of a short but bloody battle between two rival factions: the Saudi-backed Presidential Guards led by Abd Raboo Mansur al-Hadi’s son, and Emirate-backed factions that already controlled the facility. The Emirati-backed forces refused to relinquish control of the airport and a grand battle ensued. A Saudi operated Apache helicopter fired missiles at several armored personnel carriers, which instigated the battle. The fighting temporarily ceased when Hadi purportedly ordered his men to stand down. Then later the fighting resumed in March when Sudanese forces, paid for by Saudi Arabia, attempted to wrest control of the airport once more (re: Middle East Monitor, March 7th). The Sudanese mercenary forces were obliged to back down. They are the newest element in the deadly mix. The battle over the Aden Airport is being waged against a much larger and far more complex fight for Aden and southern Yemen. The fighting between rival factions backed by Saudi Arabia and the United Arab Emirates clearly shows that Yemen’s already complicated civil war is being made worse by conflict between the two external groups funding the warfare. It has essentially become a war within a war: the fight of Saudi Arabia versus the UAE and their largely Sudanese proxies. While the initial decision to intervene in Yemen was largely made by Saudi Arabia’s Crown Prince Muhammad bin Salman, Saudi Arabia has limited its involvement in Yemen to an aerial campaign. The Royal Saudi Land Forces (RSLF) and the relatively more capable Saudi National Guard have been notably absent from the war. Refer to the Saudi Army. By contrast, the much smaller but moderately more capable UAE army has led the efforts on the ground in Yemen. The UAE has deployed its forces to three areas. Escalation has been attempted by means of new mercenaries, as the UAE presidential guard is commanded by a retired Major General from Australia. The targeted areas are the central Yemeni governorate of Marib, and also smaller contingents of soldiers in al-Mukalla and the Hadramawt. See Jamestown (HERE). The upshot is that not only the Saudi oil reserves might be depleted, but much of the UAE oil reserves also. And lately, the two main Arab external players are fighting between themselves over unrealized spoils, in typical Arab fashion. Adding Sudanese merks to the mix can only result in more chaos, more costs, and more problems later. ANOTHER SAUDI PRINCE WAS CAUGHT SUPPLYING $30 MILLION (2 TONS) OF CAPTAGON DRUGS TO ISIS TERRORISTS… THE DRUG IS USED FOR ILLUSION OF INVINCIBILITY AND TO STAY ULTRA-ALERT… THE SYRIAN WAR IS FULL OF AMPHETAMINES ON THE BATTLEFIELD, JUST LIKE THE MAIDAN COUP IN KIEV UKRAINE WAS FULL OF AMPHETAMINES ALSO… THE EFFECT OF CAPTAGON IS LACK OF FEELING, BUT ULTRA-STRENGTH AND ENDURANCE. On a weekend in mid-May, Turkish anti-narcotics police seized 11 million Captagon pills in a haul that weighed almost two tons. It was en route to Gulf countries. Widely banned since the mid-eighties, these amphetamines provide a cheap long-lasting high but are highly addictive, used to keeps fighters awake over long durations. They also are known for potential to cause psychosis and brain damage. The production of the drug provides income for all factions involved in the Syrian war. Other seizures have occurred. During the last year, shipments of Captagon have been seized en route to the West Bank, Jordan, Sudan, Syria, and the Gulf States. In October, Anti-Media reported on a Saudi prince who was arrested for trying to smuggle two tons of the drug onto a plane. Yet more Saudi prince criminal actions in the drug arena. Another Saudi prince was caught in Lebanon shipping heroin several months ago, but he bought his way to freedom. As Syria has been engulfed in war, smugglers of the amphetamines have been forced to find alternate routes through Lebanon. Lebanese journalist Radwan Mortada has spent ten years investigating crime, corruption, and the war in Syria. He produced a documentary for Journeyman Pictures entitled The Drug Fueling Conflict in Syria. In it, Mortada follows the Captagon trail from users on the battlefields to traffickers on Lebanese smuggling routes, all the way to the kingpins at the top of the supply chain. Lebanon’s biggest seizure to date, the recent haul, was a whopping 50 million tablets with a street value of $300 million, weighing over 4 tons, en route to Dubai. In Mortada’s documentary, men in Beirut are shown crushing the pills and chopping them into lines much like with cocaine. They describe the effects as better than cocaine and really strong, whereas like morphine for really strong pains. Their experience points to why Captagon has become the drug of choice for some Syrian fighters. One ex-guerrilla reported having no fear when acting on the amphetamine. It curtails all feelings, making the fighters numb. It gives an illusion of feeling powerful and fit. See Anti-Media (HERE & HERE) and UK Independent (HERE). See also YouTube (HERE).